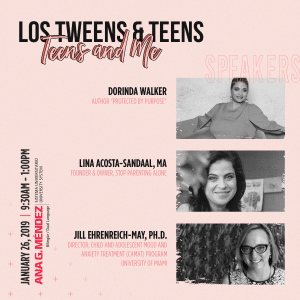 Disclosure: Los Tweens is a Neautrogena Beauty Ambassador. We receive product and compensation. However, ALL opinions are our own. I started experiencing shoulder pain the other day and realized it was from all of the bags. My big purse, the diaper bag, the beach bag, the travel back pack- I am my family’s personal camel. I dumped all of the bags onto the living room floor and started sorting through the accumulation of items. There were sea shells, maps, action figures, diapers, crayons, broken sunglasses and trinkets picked up from a variety of locations. (The photo above is just a corner of what was in my purse!) Among the random items, there was also a pattern. Each bag had the same three items. Three things that I just can’t live without. These are my go-to, all-the time item! I can’t tell you how many times these wipes have saved me especially at the beach. 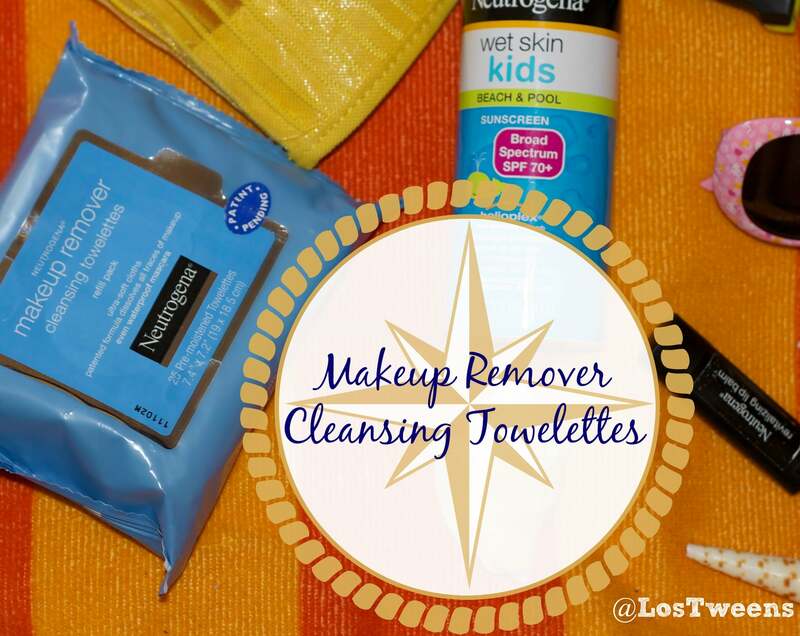 I use Neutrogena Make-up Remover Cleansing Towelettes to wipe away the sand, salt and sunscreen. 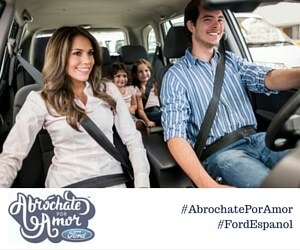 I also use it on the kids who complain the second we get into the car. The wipes allow me to go directly to our next activity feeling refreshed. My best Neutrogena Make-up Remover Cleansing Towelettes story has to be when I was speaking at a conference in the morning and promised my husband I would be at the football game with him in the afternoon. The conference was delayed and I found myself doing a wardrobe change in the car on the way to the game. I jumped out of the car and met up with my husband and our friends. As I walked up to them they all looked at me funny, my husband pointed out that I was a bit “over-dressed.” I glanced down. I was wearing shorts, my game-day t-shirt, sneakers….then it dawned on me that I still had full “conference” make-up on! I quickly snuck to the side of one of the cars. Grabbed the Neutrogena Make-up Remover Cleansing Towelettes. Wiped off the makeup. Applied a layer of sunscreen and lip balm and headed back. All set! And that’s why it tops my list of must-haves. I have Neutroegana Clear Face Sunscreen in my purse. ALWAYS! It’s specially designed to protect me from the sun and keep me from breaking out. 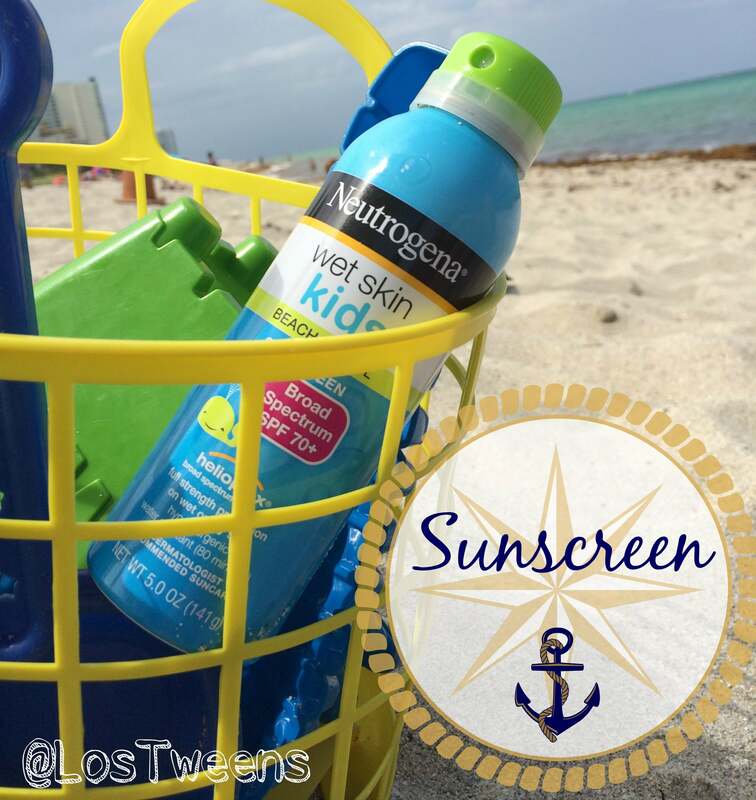 In the beach bag, you can find a plethora of Neutrogena sunscreens but my favorite is the Neutrogena Wet Skin Kids which allows you to spray, wipe or lather on over wet beach or pool skin and keep going. In all of our bags, you can find different variations of Neutrogena sunscreen and not because I’m a Neutrogena ambassador because you could of found them there long before that. 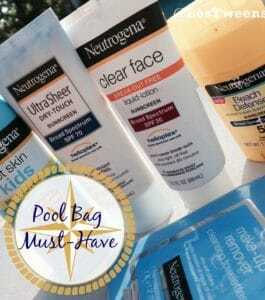 I’m a huge fan of the Neutrogena sunscreens. I’ve used different brands and levels of protection and I found that the Neutrogena brand is the only one that keeps my skin from burning every time. 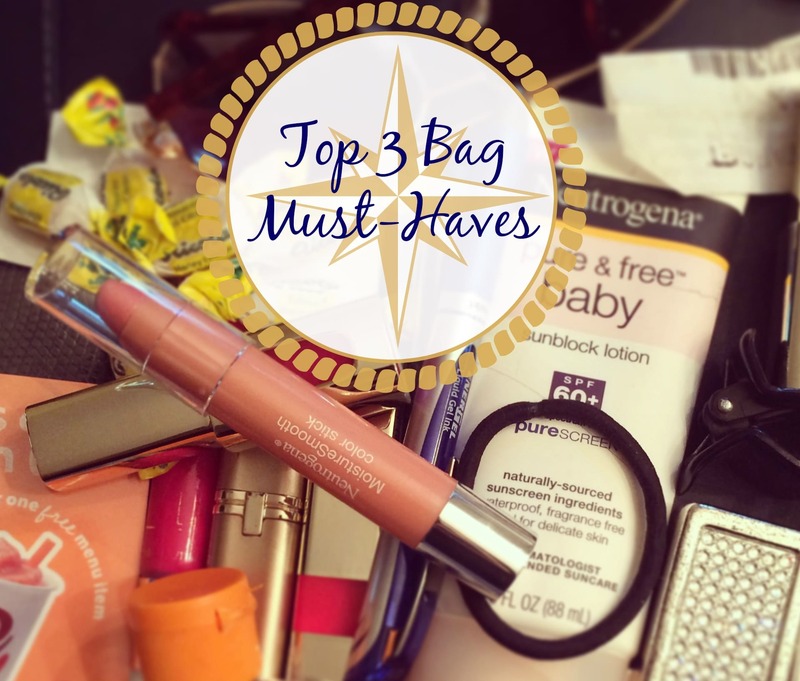 I learned from going through our bags that I am obsessed with products for my lips. I always say, you can never have too many lip sticks (or balms, or stains, or glosses…you get the idea!). 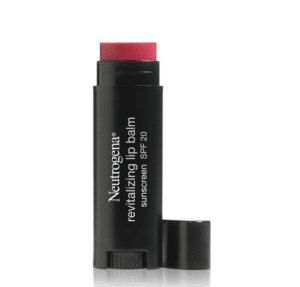 My favorite for the beach: Neutrogena Revitalizing Lip Balm in SPF 20. Its not too glossy that your hair or sand will be sticking to your lips. It hydrates just right and has SPF 20 to protect the delicate skin on your lips from burning. Plus, it comes in a size that is just perfect for the beach bag. 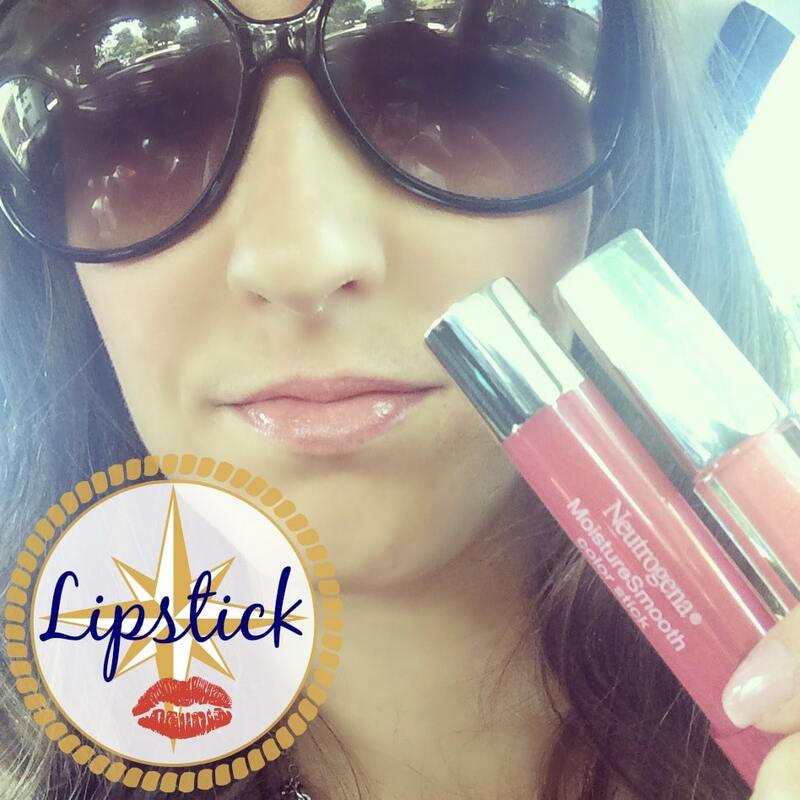 Day-to-day, I use a combination of the Neutrogena MoistureSmooth Color Stick and MoistureShine Lip Gloss. I mix colors between sticks and glosses to create my own personalized shades to what I am wearing. My newest obsession is dabbing a darker shade of the color stick to the center of my lips to create an ombre or “just-kissed” look. Grab them all and throw them in your bags! You’ll find yourself reaching for them over and over again. This entry was posted in For Mothers & Tias and tagged beauty, beauty items, lips, makeup, Neutrogena, Skin Care, sun care. Bookmark the permalink.